A filter purifies the paint you are going to spray. The thinner the paint, the finer the filter should be. 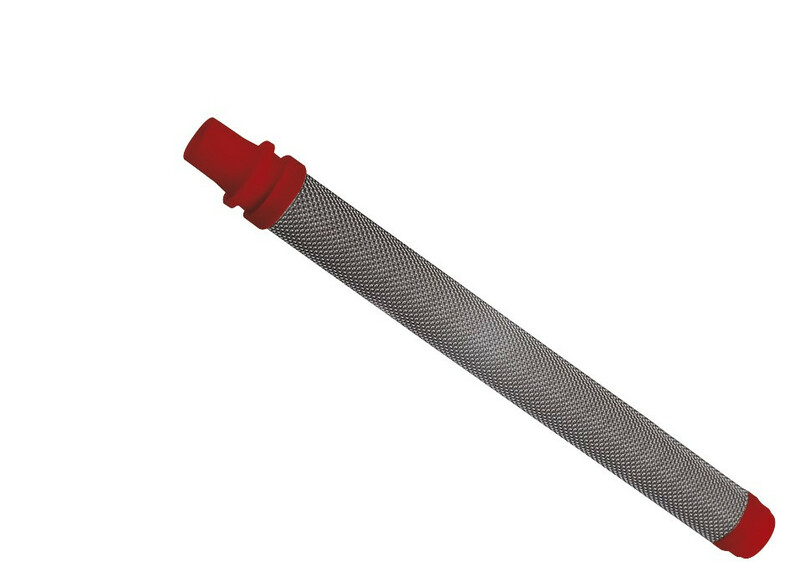 A filter will wear well and remain usable for a long time when properly cleaned. Still, it is a good idea to replace a filter occasionally in order to maintain a perfect result. The red filter is suitable for thin particles such as varnish, water and oil-based paints. It is suitable for smaller tips such as the XS 409 and S 411. The last two digits of a tip number indicate its size. The lower the number, the smaller the tip and the thinner the fluid can be. Filter XS-S red is suitable for a tip of 12 and lower. The filter must be properly placed in the handle of paint sprayer gun. The paint is forced through the filter before atomisation takes place in the tip. This catches any unevenness in the paint. The manual of your airless paint sprayer explains how to place the filter precisely. Suitable for the Wagner airless paint guns. Filter XS-S Red is suitable for thin particles such as varnish, water and oil-based paints and is suitable for smaller tips such as the XS 409 and S 411. Filter M Yellow is suitable for volatile substances, such as varnishes, undercoats, primers, fillers, interior emulsion paint. It is used in combination with middle-sized tips such as: Tip M 515 (all tips with the last two digits lower than 16). Filter L-XXL White is suitable for less volatile substances, such as: varnishes, undercoats, primers, fillers, emulsion paint interior and emulsion paint exterior, and tectyl protective coatings. It is used in combination with large tips. Consider the L 517, XL 519, XXL 521 (All tips with the last two digits lower than 22).